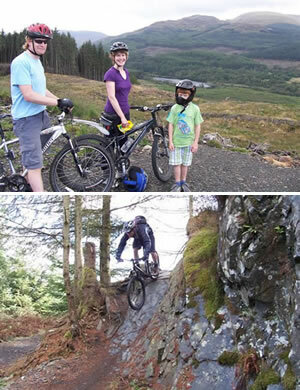 Dumfries and Galloway is the perfect destination for an unforgettable mountain biking holiday. With five of the world class 7Stanes trail centres, the stunning natural trails at Drumlanrig Castle and endless miles of some of the most scenic wild riding to be found anywhere, Dumfries and Galloway really has it all! Whether you're looking to give Mountain Biking a go for the first time or whether you are a seasoned Mountain biker, the trails in Dumfries and Galloway will not disappoint. Built over many years the trails are recognised as some of the best in the world with breathtaking views, stunning surroundings and most importantly, cycling features which exhilarate and challenge all levels of rider. Kirroughtree has some of the best single track in the world and is a family favourite venue with a cafe and kids play area. Whether you're looking to test your stamina on an epic coast-to-coast mountain biking adventure, to get away from it all with a relaxing ride through the largest forest park in the country or to polish up on your mountain biking skills on some of the finest purpose built trails in the world, Dumfries and Galloway can offer something for everyone! Local experts, Trailbrakes offer unique mountain biking holidays and skills courses from our base on the beautiful Solway Coast. We pride ourselves in being the most flexible, innovative mountain biking holiday company out there and will provide you with the tailor-made mountain biking holiday of your dreams!